Karmen Moreno McVey is the Juneau Police Department’s Re-Entry Hero for July, 2016. This new program is a way for JPD to acknowledge and show appreciation for those Juneau residents who went to prison and are now living productive, healthy lives. Karmen has come a long way. We were impressed, we think you will be too. At the height of Karmen’s drug abuse, she was injecting drugs 30 to 40 times a day. More than once an hour she would push a needle into her body. That habit was expensive and she had to steal $200 to $1200 a day just to fund her drug addiction. Karmen is now 40 years old and has used drugs most of her life, starting with marijuana when she was 7 years old. She used cocaine then went hard into alcohol. The alcohol ruined her hip joints by the time she was 26. That medical development turned out to give her almost unlimited access to oxycodone, hundreds upon hundreds of pills, increasing in potency, until her hips were replaced. Karmen wasn’t done yet, and began shooting heroin and meth together. Karmen, in prison, but she says the program wasn’t the key. What got Karmen’s attention was that if she kept using drugs, she was going to be alone and homeless, living on the streets. Karmen has six years off drugs. She has two years off alcohol, having relapsed while on probation. Her probation officer and family got her back on track without her going back to prison and she has been completely clean for two years. Karmen works for the Department of Corrections now, the same agency that incarcerated her. She does limited bookkeeping, earning more trust as time passes and she proves herself. During Karmen’s interview at JPD, she got a phone call from her husband. He wanted to know where the shovel was because he wanted to dig up one of their bleeding heart plants to give to a friend. It was a slice of suburban normalcy inserted into a story of a life of crime, drug use, and manipulating people. Karmen works every day to keep getting phone calls about domestic chores and prevent herself from cycling back to her past life. She attends a support group meeting every morning with a group of older former addicts who are committed to their sobriety. Karmen doesn’t volunteer to help people in recovery because she wants a hard boundary between her current life and her old life. There were some profound and touching moments during Karmen’s interview. First, Karmen believes that anyone can look at his or her friends and see his or her future. That is why she encourages people leaving jail to completely cut off people they know from using and from jail. They should not even be Facebook friends according to Karmen. There was an emotional moment when Karmen received her JPD coin as an acknowledgment of her accomplishments. 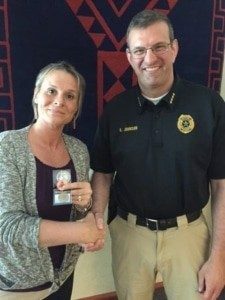 She took her two sobriety coins and slipped them into the sleeve with the JPD coin, an honor that had a visible impact on the JPD employees in the room. One of the photos accompanying this story was taken just a minute later and has Karmen showing all her coins. The black and white photo is an early booking photo. The picture with the fish shows Karmen’s life as it is now.